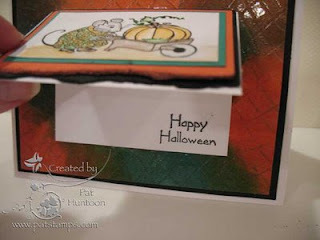 Today's Blogger's Challenge was to create a Halloween card. I have to say -- this was tough -- it is my last Halloween card this season! In any case,I chose to make a spooky background using the Distress Dragging technique from the February 2007 issue of the Technique Junkie Newsletter. 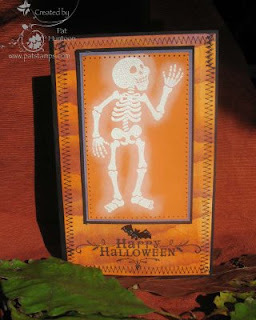 I placed my glowing skeleton (Stampendous) over that...added a stitch stamp (Starving Artistamps), my greeting (Inkadinkadoo) and added a brad...Spooky! Oh, I just have to share one more thing? What do you get when you have dolls glued all over a sweatshirt? Simple autumn colors. A simple layout. 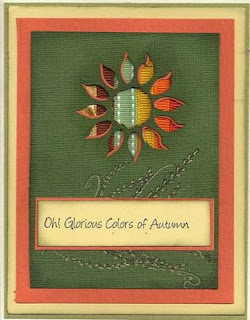 My Stippled Frame card (August 2007 Technique Junkie Newsletter) was made to celebrate the simple glory of fall. Um, what IS that in on that card? Is that a...a....a...stick? Why yes, indeed it is. In fact, it is TWO sticks. I prefer to think of it as a well, a blind. What could be more appropriate this time of year than a hunting-style card? 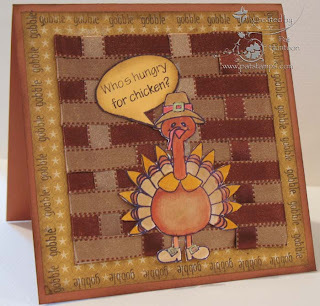 Mine was made possible today with the help from today's giveaway sponsor: CowTown Stamps. 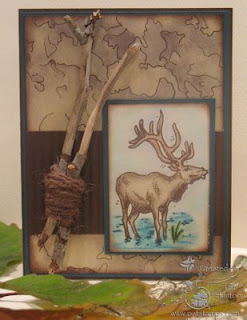 The card uses the Elk stamp from CowTown, with a Camouflage background from the October 2008 Technique Junkie Newsletter. I think it is a perfect match! 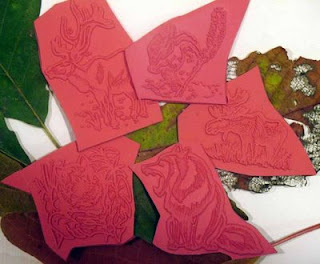 The Yawning Wolf, Chipmunk, Tiger in the Woods, Moose, and the Elk you see here are all in the giveaway. I think you will adore these high-quality rubber stamps -- they are great for masculine cards. Personally, I never seem to have the right stamp for card-making for the men in my life, so these have been a welcome sight in my stamp room -- enter the giveaway and you could have a set of them too! Better yet, go to CowTown Stamps and get your own set -- you will received 10% off by entering "Cowjunkie" in the comments section of your checkout (do not enter it in the coupon code; use the comments instead). ANYONE can enter this give away.One entry per person, per give away, please. To enter the give away for today, simply leave a comment on this blog entry telling me that you would like to enter by 11:59pm EST on Sunday, November 2nd. No other entry methods will be included in the give away. If you email me to enter, your entry will NOT be considered a valid entry. When you leave the comment, make sure to put your NAME in the comment -- if you enter your comment as "Anonymous", I cannot give you the prize! Blogger does NOT record your email address for me, so you will need to check back to find out if you have won or include your email address in your comment so that I can notify you. A good way to do this is like so: phuntoon at optonline dot net -- it will help protect your privacy! I will have a random number generator pick one number from the comments to select one winner. Each give-away is separate, so to be eligible for a specific item you must enter that day's contest on the post where it is listed. Enter today -- good luck! I have blog give aways every Wednesday -- come play! The winner of the giveaway is C Meyers! Congrats! Fall is my favorite time of year. Living in Connecticut, the leaves are so gorgeous in autumn...it is impossible NOT to love fall. 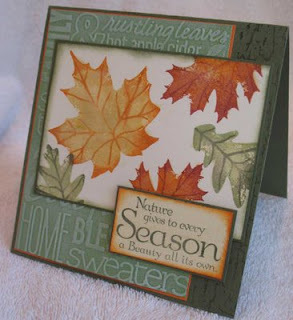 I think this card captures autumn perfectly! It makes me want to put on a sweater and take a walk in the cool, fresh air. 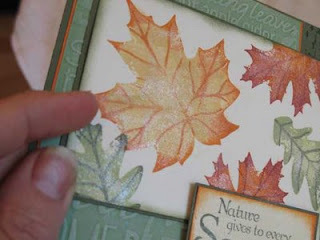 The leaf stamps in this card were made with Close To My Heart using the Stamp Rolling Technique from the Technique Junkie First Edition CD. The light green panel uses the Cuttlebug Highlight Technique from the October 2008 issue of the TJ Newsletter. Of course, I HAD to add some Shimmerz Paint to the leaves, too. I just couldn't help myself! 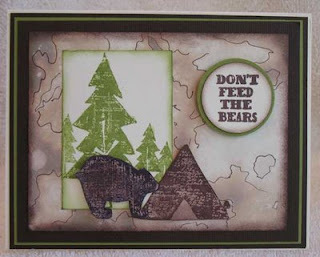 The crackle stamp on the dark green cardstock is from Stampin' Up!, and the saying is from Club Scrap. I hope your fall has been as beautiful and colorful as mine! Boy, am I ever going to miss Halloween. I just LOVE making Halloween cards! This card was made for the Technostamper Sketch Challenge #41. I used I Brake for Stamps Halloween Plate with a Veined Marble Background from the August 2007 issue of the Technique Junkie Newsletter (Gosh, it was that long ago?). 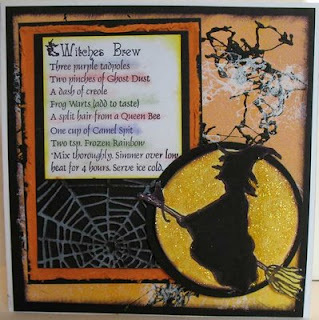 The Witches Brew recipe is layered on a Cuttlebug Highlight Spiderweb (October 2008 issue, TJNL). I also glittered the moon with Yellow Stickles. It just screams for that, doesn't it? *Mix thoroughly, simmer over low heat for 4 hours. Serve Ice Cold. Hope you enjoy your brew! What is your favorite Science Fiction book? One of mine was 1984 by George Orwell. I read it as a teenager, um, before the year 1984 (oops, just aged myself!). I remember being so affected by the book, and a little frightened for the future. I originally bought these stamps to scrapbook pictures from my son's Boy Scout camping trip. They are just too cute to let languish on my shelf, though. They seemed a perfect match for the Camouflage Technique from the October 2008 issue of the TJ Newsletter, too. I love my Bear card! This week's Bloggers Challenge (#70) was to make something that you would give as a gift. I made this little candle basket, which I plan on taking to my SIL's house this weekend when we visit. I have a little confession: I struggle with this kind of thing. I usually approach them with a moderate level of dread, since I know that 3-D stamped things usually end up looking like a Kindergartner made them when they are crafted from my hands. I actually like this one, though. 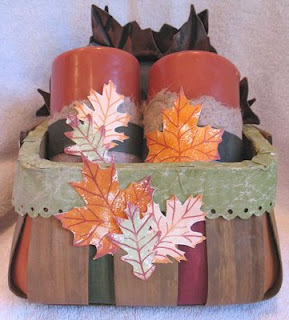 The leaves were done using the Stamp Rolling technique from the Technique Junkie Newsletter's 1st Edition CD. Stamps are from Close to My Heart. I am uber-super excited. Today's giveaway is NOT stamps. 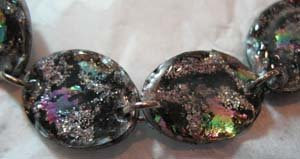 Instead, I have these gorgeous Shimmerz Paints! If you have not yet heard about Shimmerz Paints, you are in for a wonderful, fun, glimmering time...They are happiness in a bottle! One thing I discovered while working with them is that when I wanted a different color, I simply colored my image with marker underneath, then painted over that with the Shimmerz Butter Cream -- it was like having custom colors at my disposal! ANYONE can enter this give away.One entry per person, per give away, please. To enter the give away for today, simply leave a comment on this blog entry telling me that you would like to enter by 11:59pm EST on Sunday, October 26th. No other entry methods will be included in the give away. If you email me to enter, your entry will NOT be considered a valid entry. When you leave the comment, make sure to put your NAME in the comment -- if you enter your comment as "Anonymous", I cannot give you the prize! Blogger does NOT record your email address for me, so you will need to check back to find out if you have won or include your email address in your comment so that I can notify you. A good way to do this is like so: phuntoon at optonline dot net -- it will help protect your privacy! I will have a random number generator pick one number from the comments to select one winner. Each give-away is separate, so to be eligible for a specific item you must enter that day's contest on the post where it is listed. Enter today -- good luck! I have blog give aways every Wednesday -- come play! Congratulations to Carey Rogers -- the winner of these paints! 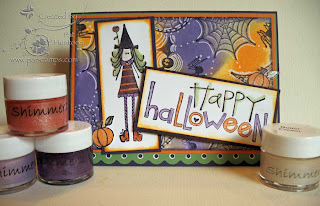 I recently participated in a card challenge to make a Halloween card using all Stampin' Up! stamps, and this is the card that I made for my partner. I think it just, well, ROCKS! 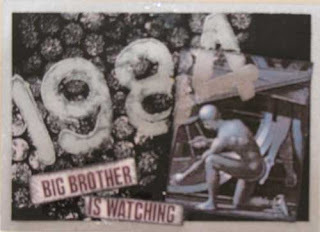 The card uses the Designer Tile Technique from the August 2008 issue of the Technique Junkie Newsletter. 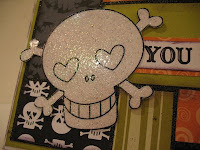 I especially love this skull -- after stamping it I covered it with VersaMark, covered it with glittering translucent embossing powder, heat set it and cut it out. I love the shimmer of it! I have a close-up below. I hope my partner likes this card! The stamps and paper are all from SU. 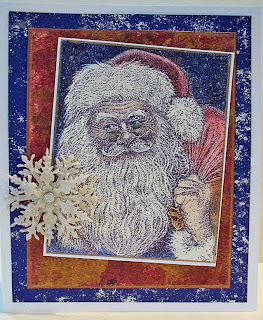 I just love this Santa from Rubberstamp Avenue. It is my all-time favorite. To me, this IS Santa. I couldn't resist using him for the Technostamper Sketch Challenge (#40) this week! I stamped my Santa in black, then colored him with chalks. i edged him in gold, layered in white, then put him on a rich piece of Faux handmade paper (August 2008 issue of the Technique Junkie Newsletter). That is layered on a piece of blue embossed paper, over a white card. The snowflakes are felt, and I added glitter to them. Doesn't it just leave you wishin' for December 24th? I missed the Technostamper Sketch Challenge this week, so today's post is here to make it up...and boy did I have a good time doing this! 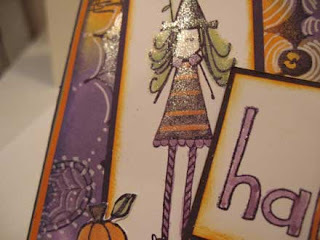 The front panel on this card uses the Glitter Masking Technique from the October Issue of the Technique Junkie Newsletter. 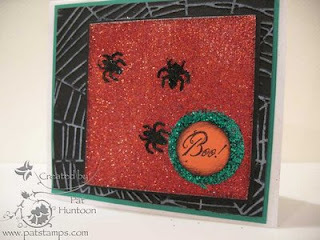 The Spiders, and Circle and the orange square are all glittered! That panel is layered over a spiderweb piece of Cuttlebug Highlights, also from the October issue. The Boo stamp is from The Angel Company. BC: What's the Word, Bird? 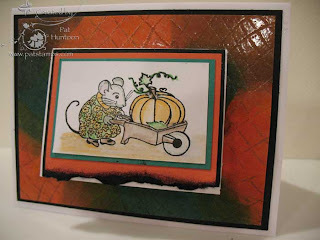 Today's Blogger Challenge was to use a color combination of Riding Hood Red, Really Rust and Old Olive. I think this is a pleasing palette and I had fun with it! 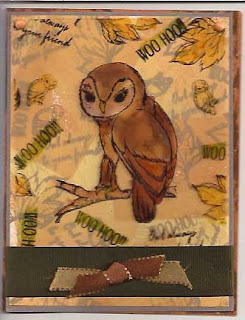 To make my card, I watercolored the owl using the dye ink pads (from the three colors above) and layered it on a panel using the Polished Wrinkles technique from the October 2008 issue of the Technique Junkie Newsletter. Believe it or not, the polished wrinkles layer was done with the colors assigned to the challenge -- it just fades a bit with the water and with heating. 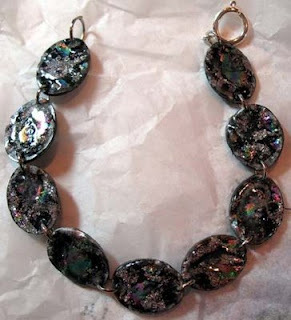 It has a great shimmer to it, though! I love the quirky saying! "What's the Word, Bird?" Have a nice weekend -- and make sure to check out the work from the other Blogger's Challenge players. Just click on the logo on my sidebar to access their sites. 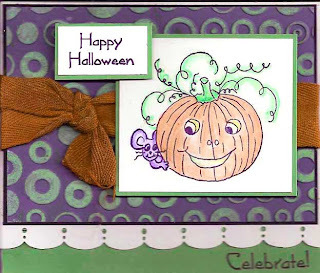 I just liked the Clear Artistic Stamps from the giveaway so much yesterday that I had to make another card today. This time I used the Snakeskin Technique from the October 2008 issue of the Technique Junkie Newsletter and made a little flap front for an extra message. I adore the way this turned out. It's funny -- I always think that I "don't do cute". I guess I DO, don't I? 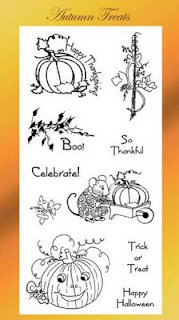 In any case, these stamps are on sale right now at Clear Artistic Stamps until Tuesday October 21, 2008 for only $8.95! Remember that I am giving the stamps for this away CLICK HERE to place your entry. I am so sorry -- I neglected to add the discount from Clear Artistic Stamps into the blog post for the giveaway! Here are the directions to receive a generous 15% off! E-mail your their order to clearartisticstamps@belindalandtroop.com Belinda will do a discount of 15% on the order. That does include sale items. Then she will send an invoice through PayPal. Halloween scary? No way! 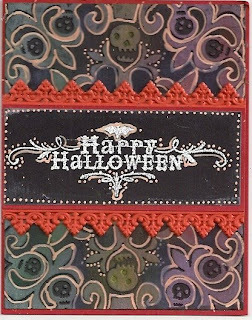 This card was made with terrifically fun stamps from Clear Artistic Stamps, our Wonderful Wednesday Giveaway sponsor this week. 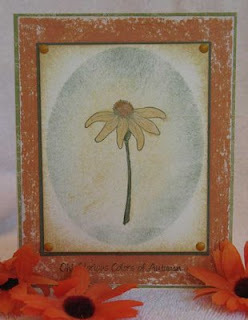 The main panel of this card was colored with pencils and gamsol. It is layered on a purple piece made using the Cuttlebug Highlights Technique from the October 2008 issue of the Technique Junkie Newsletter. The ribbon was colored using Starburst Stains and dried (it is GORGEOUS in person!). I love how bold the colors are together in person -- the purples, the bright green on the Cuttlebug portion, and the shimmer to the ribbon are just perfect with the fun feeling of the stamp. Here are the directions to receive a generous 15% off! Belinda will do a discount of 15% on the order. That does include sale items. Then she will send an invoice through PayPal. Okay, so how do you enter this giveaway? ANYONE can enter this give away.One entry per person, per give away, please. To enter the give away for today, simply leave a comment on this blog entry telling me that you would like to enter by 11:59pm EST on Sunday, October 19th. No other entry methods will be included in the give away. If you email me to enter, your entry will NOT be considered a valid entry. When you leave the comment, make sure to put your NAME in the comment -- if you enter your comment as "Anonymous", I cannot give you the prize! Blogger does NOT record your email address for me, so you will need to check back to find out if you have won or include your email address in your comment so that I can notify you. A good way to do this is like so: phuntoon at optonline dot net -- it will help protect your privacy! I will have a random number generator pick one number from the comments to select one winner. Each give-away is separate, so to be eligible for a specific item you must enter that day's contest on the post where it is listed. Enter today -- good luck! I have blog give aways every Wednesday -- come play! Congratulations to Michelle Sampson, the winner of this giveaway! Just a quick little card I made for a friend I am inviting to Thanksgiving dinner. I thought it was appropriate today because it is the Thanksgiving Holiday in Canada today, too. Happy Thanksgiving to our friends to the North! 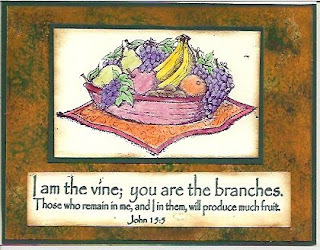 This card uses stamps from Our Daily Bread Designs. The background uses the Patina Technique from the October 2008 issue of the Technique Junkie Newsletter. These stamps make me chuckle. I just adore them! One lucky winner of this giveaway will adore having them in their collection, too. These Sweet 'n Sassy Stamps for today's giveaway were layered on top of a piece of Basket Weave Background (from the October 2008 Technique Junkie Newsletter). I colored the turkey with Copic Markers, and cut out the images -- a fun, quick card! I really like all the sayings that these stamps come with -- they are just great! Sweet 'N Sassy is thrilled to announce that the Rachelle Anne Miller Christmas Collection has arrived! If you have not seen all of the stamps offered by Sweet 'N Sassy now, you will be amazed by the variety of stamps now in the store. And don't forget, Technique Junkies receive 10% off -- use the code tjmember08 for YOUR discount. Here are the stamps for today's giveaway. Okay, so how do you enter this giveaway? ANYONE can enter this give away.One entry per person, per give away, please. To enter the give away for today, simply leave a comment on this blog entry telling me that you would like to enter by 11:59pm EST on Sunday, October 12th. No other entry methods will be included in the give away. If you email me to enter, your entry will NOT be considered a valid entry. When you leave the comment, make sure to put your NAME in the comment -- if you enter your comment as "Anonymous", I cannot give you the prize! Blogger does NOT record your email address for me, so you will need to check back to find out if you have won or include your email address in your comment so that I can notify you. A good way to do this is like so: phuntoon at optonline dot net -- it will help protect your privacy! I will have a random number generator pick one number from the comments to select one winner. Each give-away is separate, so to be eligible for a specific item you must enter that day's contest on the post where it is listed. Enter today -- good luck! I have blog give aways every Wednesday -- come play! The winner of this giveaway is Roxi Adams! Congratulations! I should not be buying stamps. Ever. I have billions. But I can't resist! I was in the stamp store purchasing chalk refills (ahem, junkies, that may be a December hint) when this Happy Halloween stamp just jumped out at me. I knew that this cool Cuttlebug folder had been calling me for a week or two -- so I just had to have the stamp (by Inkadinkadoo) so I could make a happy marriage between the two. My creation combines the Cuttlebug Highlights technique (October 2008 Technique Junkie Newsletter) with the Bandanna Technique (August 2008 newsletter). This time, though, I used a Souffle Pen to out line the embossed areas. Did I mention that those pens jumped into my basket, too? My highlighting on this is not perfect, but I am reveling in it's imperfection...Happy Technique Blitz. Today's Blogger's Challenge was "Falling for You." I chose to take the suggested theme literally and make a fall-themed card. In keeping with the Technique Blitz this month, I used the Punched Through Technique from the Ribbon Extravaganza in the October 2008 issue of the Technique Junkie Newsletter. All stamps are from Firecracker Designs by Pamela. I have had this for a while, but I just cannot seem to take a picture of this that looks nice. Well, that is part of it -- the other part is that I just never seem to remember to do it! 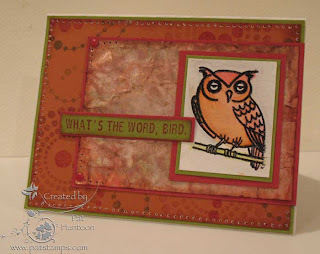 Today's Wonderful Wednesday giveaway is a hoot! 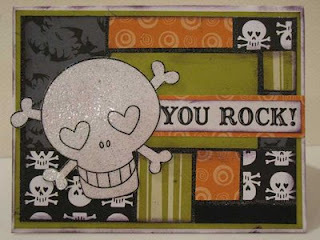 These fun stamps by Firecracker Designs by Pamela are a delight! The card made for today's giveaway was made using the Geometric Overlay technique from the October 2008 issue of the Technique Junkie Newsletter. I changed things a bit, though, and colored the owl and front images with Copic Markers and watercolor crayons. I love how dimensional this is in real life! The stamps for the giveaway are below...make sure you visit Firecracker Designs by Pamela -- and don't forget Technique Junkies receive a discount! Make sure to enter ILOVETJS for your 10% discount...Click on the Firecracker Designs link in my side bar to get there quick. Okay, so how do you enter this giveaway? ANYONE can enter this give away.One entry per person, per give away, please. To enter the give away for today, simply leave a comment on this blog entry telling me that you would like to enter by 11:59pm EST on Sunday, October 5th. No other entry methods will be included in the give away. If you email me to enter, your entry will NOT be considered a valid entry. When you leave the comment, make sure to put your NAME in the comment -- if you enter your comment as "Anonymous", I cannot give you the prize! Blogger does NOT record your email address for me, so you will need to check back to find out if you have won or include your email address in your comment so that I can notify you. A good way to do this is like so: phuntoon at optonline dot net -- it will help protect your privacy! I will have a random number generator pick one number from the comments to select one winner. Each give-away is separate, so to be eligible for a specific item you must enter that day's contest on the post where it is listed. Enter today -- good luck! I have blog give aways every Wednesday -- come play! Congratulations to Mary Davidson, the winner of this giveaway!